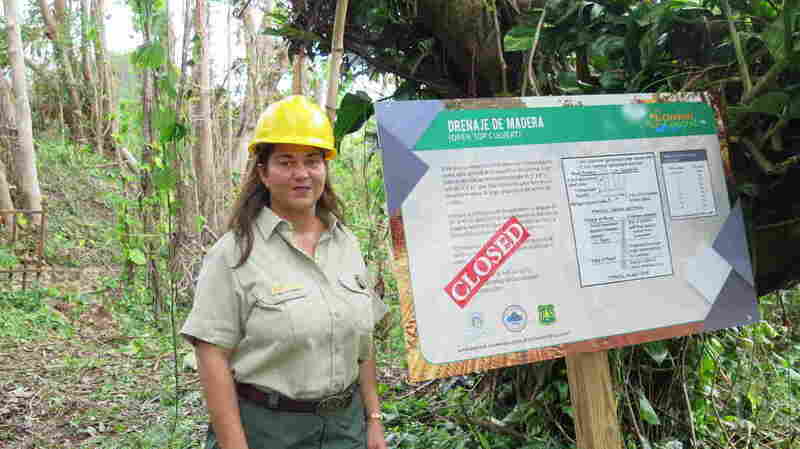 Post-María, A Key Ecosystem In Puerto Rico Faces Slow Recovery El Yunque National Forest is a world-renowned research site and one of the U.S. territory's top tourist attractions. The hurricane hit the rainforest hard, and it remains closed until further notice. Before the hurricane González says it was very comfortable walking in the forest, and the ground was cool and moist. "But, all of that changed. It was very powerful." El Yunque took a direct hit from the Category 4 storm and remains closed to the public. Although some leaves are coming back, the canopy was still largely bare in November. González says researchers believe as many as one-fifth of the trees in the 28,000-acre tropical rainforest may eventually die as a result of the storm. 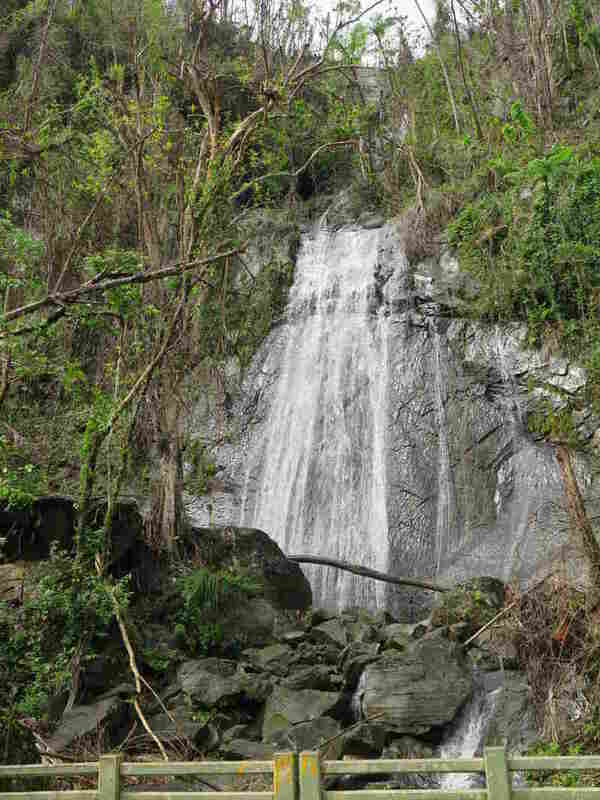 González, who is project leader of the research unit at the Forest Service's International Institute of Tropical Forestry, says El Yunque has long been her passion. Ever since she was a child, her dream was to live and study in the Luquillo Mountains, where El Yunque sits, and her first job as an undergrad was to look there for worms as part of an ecology professor's research. "El Yunque is a very special place," she says, "because it's the [forest] that has the highest biodiversity than all of the other forests combined in terms of plant species." El Yunque is the only tropical rainforest in the U.S. National Forest System, and one of the oldest reserves in the western hemisphere — first set aside in 1876 when Puerto Rico was part of Spain. It is home to more than 250 native plant species and almost 200 vertebrates, many of them endemic to El Yunque, including one of the world's most endangered birds, the Puerto Rican parrot. Researchers are still trying to get a count of the wild population which, before Hurricanes Irma and María was thought to number just over 50. Green had begun returning to El Yunque a few weeks ago, in large part due to all the rainfall since the hurricane. One of its best known sites, La Coca Falls, is more spectacular than ever. "The system is working," says González, while standing at the bottom of La Coca Falls. You can see the filtration of the water, González says, as water cascades 85 feet down onto a rock formation by the road. The forest supplies more than 20 percent of the water to Puerto Rico. "[But] even though it's recovering, we see the effects of the hurricane on the vegetation around it," she continues. Work crews using heavy machinery, like loaders and bulldozers, are still clearing roads and trails so staff can assess the damage and determine when it's safe to reopen the national forest to visitors. "We are going to kind of go through a chapel of bamboo, a tunnel of bamboo," she says with a smile on her face while walking along a trail where a large stand of leafy bamboo has fallen over the road creating a green canopy. The soil in El Yunque has a high percentage of red clay and the rough, uneven and muddy trail leads to a place that's been washed out and given way to a landslide. "If you look upslope, the landslide is still active, so there's no possibility really to go over it," González says pointing up high. The landslide is not stable yet and there is no way to know how much worse it can get. "We still have not done the engineering assessment," she says, explaining that her office has not been able to bring in experts to assess what would it take to reconstruct this place. Many scientists have ongoing projects at El Yunque and now researchers from across the island are starting to come back to study Hurricane María's impact on the rainforest. "Today we put in traps. Tomorrow, we come pick them up," says Marla Santos standing next to the Sabana stream in the forest. She's a sophomore at the University of Puerto Rico who is part of a group that's conducting longterm research on species of freshwater shrimp. "We measure the shrimp. We count them. We see the species." Then they release them, she says. Santos and her team, led by Biology professor Omar Peréz, take two shrimp samplings a year — one in March and one in November. They have no idea what they expect to find this time, but say they are prepared for almost anything. Hurricanes are an important force that's shaped El Yunque's ecosystem. Santos says Hurricane María, a Category 5 storm that lessened to Category 4 before hitting Puerto Rico, provides researchers with a rare opportunity. Hurricane María's 150-mph winds destroyed the tropical rainforest's canopy and stripped trees bare. Scientists believe as many as one-fifth of the forest's trees may eventually die from the storm's effects. "I think we can see how resilient the forest really is," she says, her eyes widening in excitement, "Now we're like, 'Yes, this is what happens in a Category 5 hurricane and this is how our island can properly recover from it.'" The Taíno people are the indigenous people of several Caribbean islands, including Puerto Rico, and they considered the Luquillo range sacred. Ecologist Grizelle González remembers family visits to the forest as a child. She grew up fascinated by the pre-columbian mythology surrounding El Yunque, and she's not alone. Many Puerto Ricans have an intimate connection to the forest not only for its native species and its ecosystems, but because of its geography. El Yunque sits on the island's eastern edge, on the slopes of the Luquillo Mountains. The word "Yuke" means white lands, and it's a reference to the mountain tops high in the sky and usually covered by clouds. 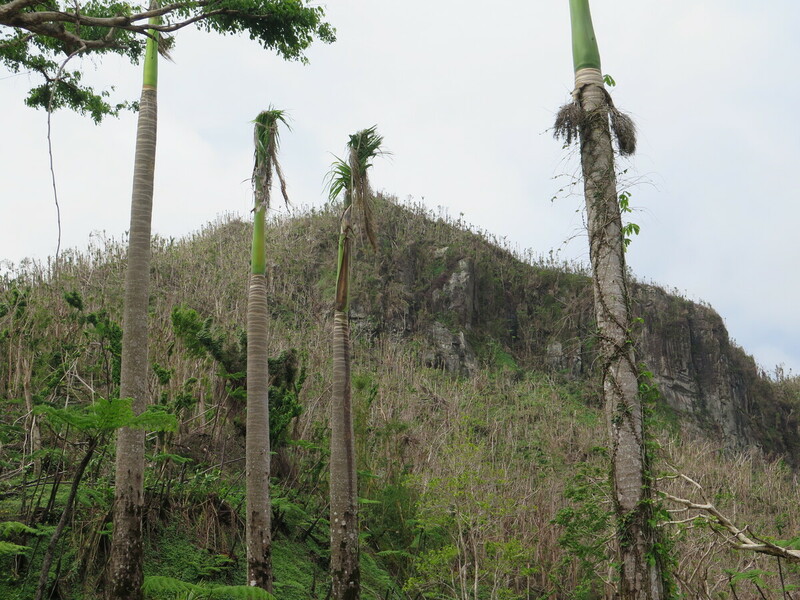 Many people think that the forest is the protector of the island because the area often takes the first hit and reduces the intensity of hurricanes when they sweep over the island. "That's why you see so many images of the forest and people loving it, because they see it as our protector," she says. As González stands in the Bisley watersheds area looking out at the mostly barren forest, she says that green sprouts already peppering the area give her hope, but she doesn't know how long it will take for El Yunque to recover.